discoveries. 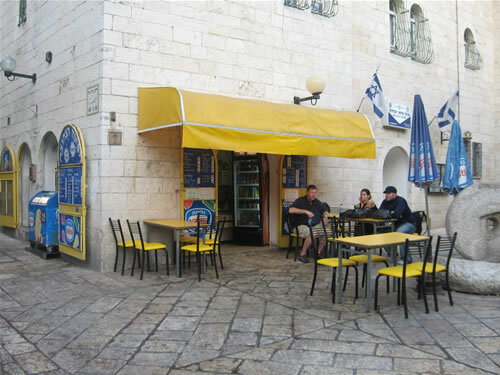 Today there are numerous synagogues and schools for Jewish studies, along with contemporary shops and restaurants up and down the streets. 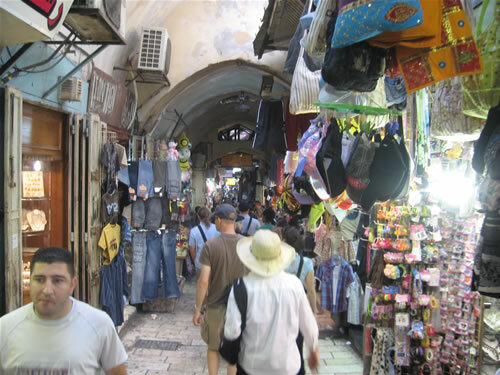 The ancient Roman Cardo Street (135 AD) with its old Byzantine bazaar (325 AD) has been preserved and is filled with trendy new businesses that sell a wide variety of items, including original art work by local artists. 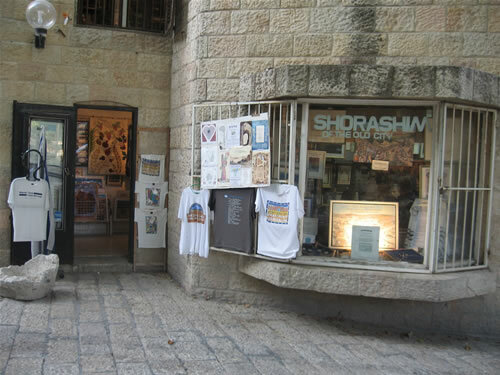 A bookstore with Jewish t-shirts, jewelry, photos, etc. 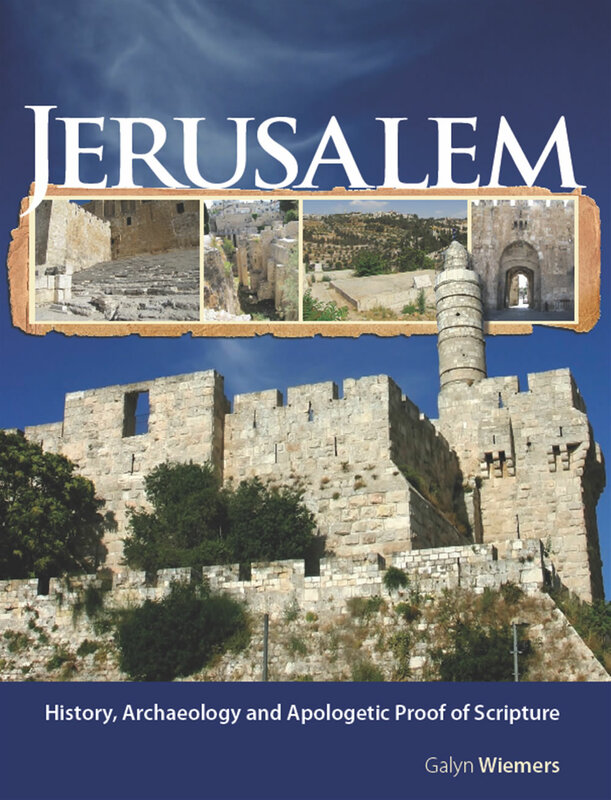 located just west of the Western Wall. It is the Jewish version of a Christian bookstore. I spent a couple hours on two different occasions talking to the owner. He has written two books. A friendly Orthodox Jew who approached me to talk and volunteered to exchange photos at the Western Wall. Notice the Herodian Ashlar stones in the wall behind him. The thin partition wall on the right side of the photo seperates the men and women's side of the Prayer Plaza. 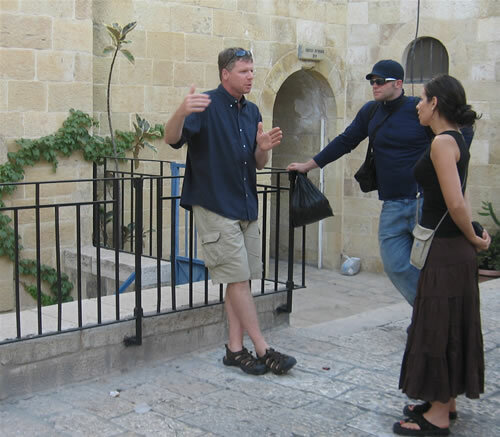 Galyn, Ryan and Jenn talking in the streets of the Jewish Quarter in Jerusalem. Here we are at a Jewish cafe in the Jewish Quarter. Class at mid-night on the prayer plaza at the Western Wall. Israeli police and IDF (Israeli Defense Force) leave the West Wall Plaza in the Jewish Quarter. been filled with shops. Closer to the Temple Mount (or as the Muslims call it the Hara mesh-Sharif, meaning “The Noble Sanctuary”), buildings from the Mamelukes’ reconstruction of the city from 1250 to 1516 can be seen. This area today preserves some of the fine medieval Islamic architecture. 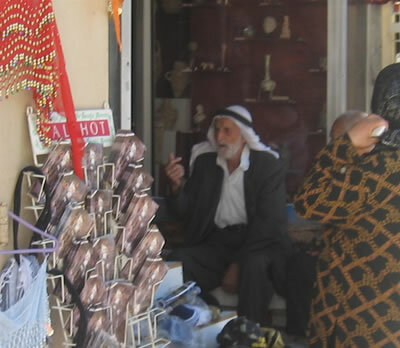 Toni (white straw hat) shopping in the Muslim Quarter through the covered street bazaar. Galyn purchases a Coke and a bottle of water in the Muslim Quarter. The Damascus Gate from the inside. 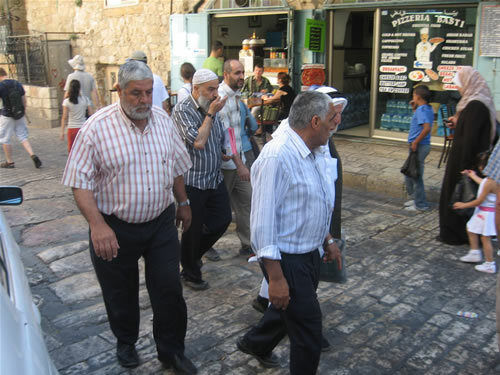 Israeli soldiers patrol the Muslim Quarter. Cell phone on the Temple Mount. The nation of Armenia was the first nation to declare itself a Christian nation. They did this in 301, before the days of Constantine, but Armenians had been living in Jerusalem since 95 B.C. 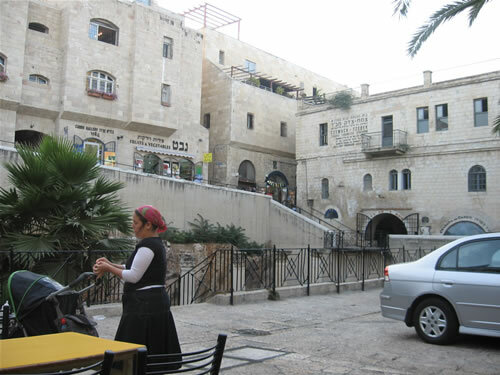 The Armenian Quarter was established on Mount Zion 301. Right before the Crusader period (1099-1187 A.D.) the Armenian Quarter began to develop. It reached its current size during the Ottoman period (1517-1917). Today the Armenian “quarter” covers about one-sixth of the Old City. An Armenian woman hand paints the ceramics created in her father's local shop. 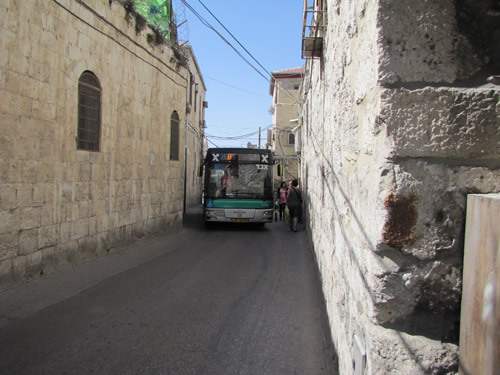 Buses and cars run through the narrow streets in the Armenian Quarter by entering and exiting the Joppa Gate. Smaller cars also use the Zion Gate. Israeli soldiers at the Zion Gate in the Armenian Quarter. The streets of the Old City in the Armenian Quarter early in the morning around 1:00 AM. JUC, Jerusalem University College, on the Mount of Zion just outside the walls of the Armenian Quarter. Dr. Carl Rasmussen and Mary bumped into Toni and Galyn outside the Armenian Quarter. Carl and Mary were returning from an excursion in the West Bank in the ancient land of Benjamin and the city of Jericho. Toni and I were photographing the west wall of the Old City. 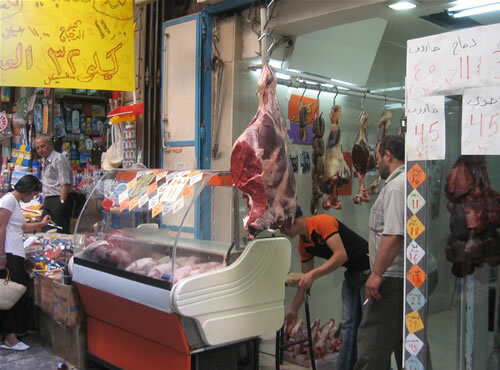 The Christian Quarter is the most visited quarter of the Old City because it includes the site of Jesus’ death, burial and resurrection—the Church of the Holy Sepulcher. This quarter is cluttered with a seemingly endless cluster of churches and holy sites whose roofs, domes and facades are built so close together that they are undistinguishable. 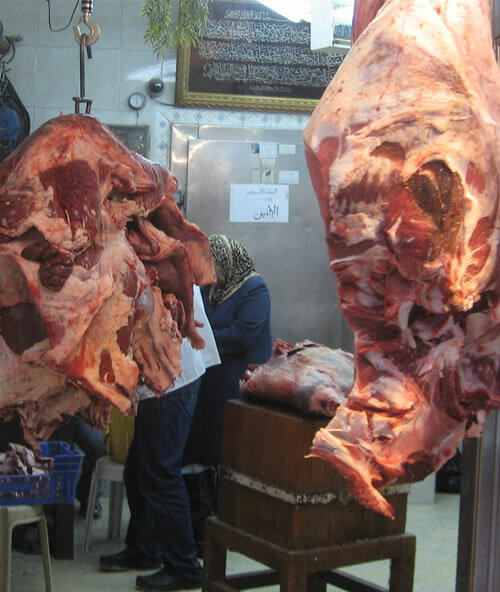 The streets are filled with narrow storefronts leading into shops that continue long narrow paths to the back. 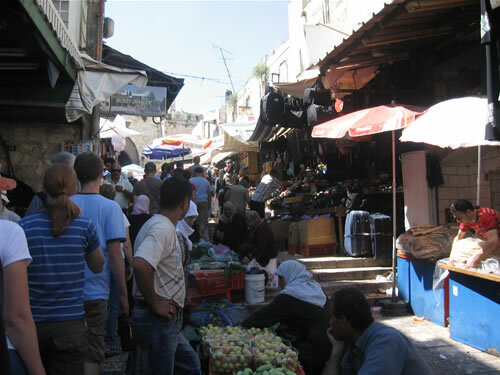 The market streets are noisy with modern pilgrims and shopkeepers trying to lure them into their stores. Roofs of the Christian Quarter. Notice the Dome of the Rock ( left middle of this photo) which is in the Muslim Quarter. Mount Olive is in the background. A Christian priest with the Joppa Gate in the background.